Alisa talked a lot about the tenacity, perseverance and stick to it attitude that it took to got her through her tougher times as a coach when she was starting out over 16 years ago. She believes that when we can remember our purpose (and this can be with a little p) and when we stay in alignment and make choices that move us closer to our purpose, that we will be able to stay buoyant during the challenging times. This weekend reflect on your values, your purpose and what brings meaning to your life. Then gently reflect on your work life, your family life and your life out in the world. Are they in alignment? Do they fuel one another? Do you feel as though the choices you make are moving you closer to what matters? Alisa talked about the importance of gratitude. She reminded us to “Always and forever focus on what you do have” I mentioned that my mentor Tal Ben Shahar often said appreciate the good and the good, will appreciate. Take a moment to reflect back on this past week. With a light touch notice, if you noticed more of what was going well or more of what was going wrong. Remember our negativity bias will pull us to the dark if we are not mindful. This weekend spend the morning thinking about two things you are looking forward to that day. Spend mid-morning bringing to mind two people that make your life sweeter, and in the evening reflect back on your day and think of two things that you are grateful for. 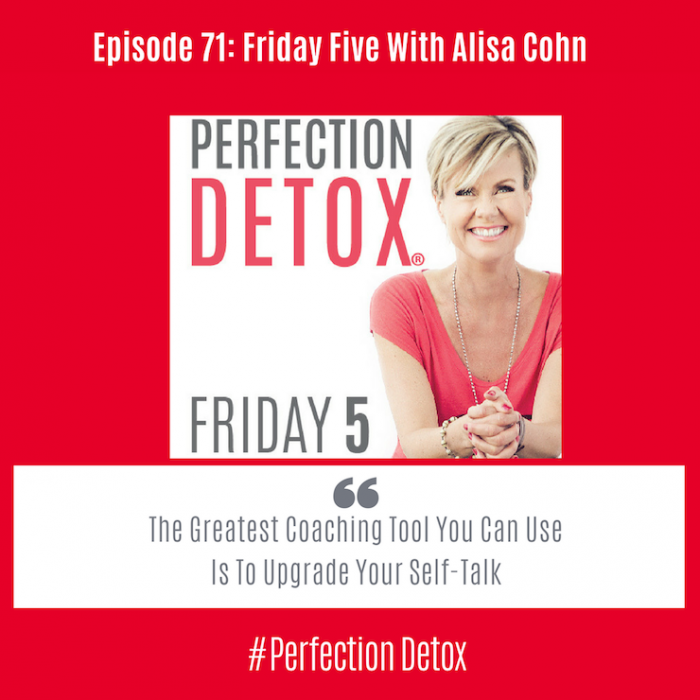 “Upgrade your self-talk” This was Alicia’s top coaching tool, one that she recommends we all nurture and strengthen. The conversations we have internally when no one is looking will either beat us up or lift us up. This weekend become more aware of the silent conversations that go on behind the scenes – with curiosity and once again a light touch, simply notice how many times you catch yourself in a self-talk that is negative in nature. Find a mini mantra that you can use to stop the old tapes. Perhaps it is “I am enough” or my favorite, “Be Here Now” As when we are in the present moment the worries and doubts of the past or future drift away. Alisa talks about the importance of self-care and how to manage our time well. Tactically she reflected on the importance of sleep, nutrition, and exercise. Alisa also talked about emotional self-care and the importance of having people in your life that you can be yourself with. She also reminded us of the importance of carving out time to do what nourishes your inner world. Some examples are reading, gardening, sports or family time. This weekend pick one of these areas and make one small choice that will nourish your life. Each day, try and take one more action step that will move you closer to being your best self. Small habits each day will create massive positive change over time. Alisa talks about motivation and how to find it on the days we feel empty. She reminded us of the power that comes with asking open-ended questions – ones that cannot be answered with a simple yes or not – to help us mine the data that can fuel our dreams. This weekend reflect on a few open-ended questions: What fires up your joy? What do you love to do? How do you want to be remembered? What have you not done that you said you would do? And then ask the powerful question of – if not now – when? If not you – who?